Writing Contest! - 4 Days Left before SteemBet Launch! This is our 4-day countdown post before launching on February 13, 2019! To engage with the Steem community more, and to reward more early supporters with SBT (SteemBet token) before launch, we would like to host a writing contest! 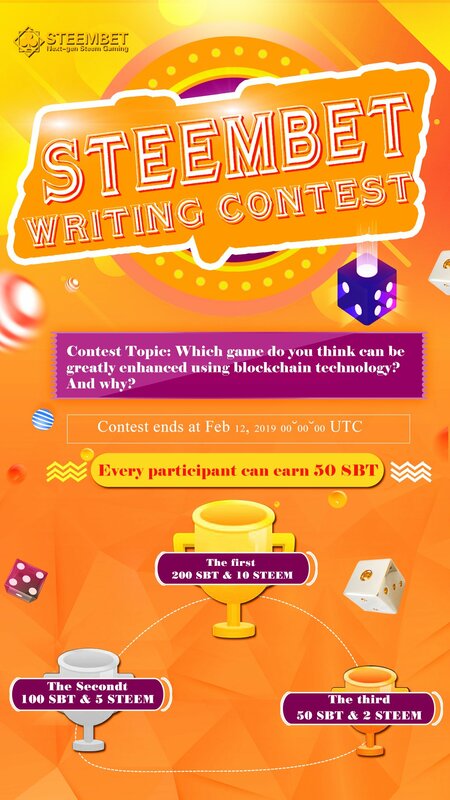 Writing Contest Topic: Which game do you think can be greatly enhanced using blockchain technology? And why? Dixie Dean was up with the best sporting legends that have ever lived. A high quality popular slot, fruits or classic. Don't even think to launch a dice game. yep. our platform will have 5 games. I’ll give this a shot. @steem-bet purchased a 98.63% vote from @promobot on this post. I like your post. Writing competition! Thank you for informing us about this issue 4 days before the launch of the Steamet launch. And I want to take part in this competition. I have an idea with sports betting collaboration. Will write an article on that update you with the link below. Only one deck with reshuffle after every play to avoid card counting. @steem-bet this is my entry post mate. I also resteemed both of your posts. I hope that your service will not have bandwidth issues and outages like your competitors are currently experiencing. I'm curious, what will be the total supply of the token? This is if it hasn't been mentioned before. What about sports beting.and What's more about the action. Thank you for hosting this amazing contest! Good luck everyone!